A system of approval exists for issuing local government bonds under Japan's local public finance system, which requires the authorization of the Minister for Home Affaires (currently, the Minister for Internal Affairs and Communications) or the prefectural governor. Under this system, long-term low interest rate loans in the Fiscal Investment and Loan Program (FILP) are predominantly allocated to financially weak local government. 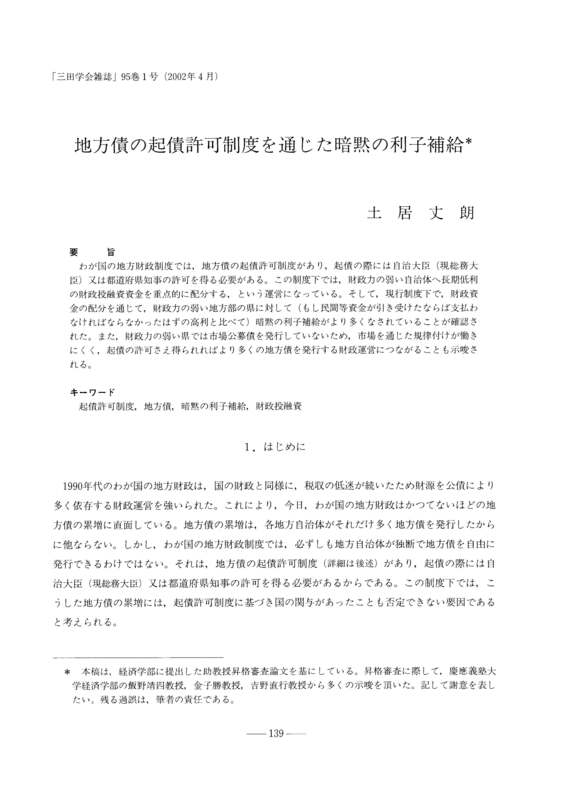 This paper confirms that under this system, the allocation of FILP funds provides a tacit subsidy for interest payable (compared to the high interest rate that would have to be paid if funding were underwritten by private financial institutions) to prefectures of financially weak prefectural government. In addition, it is difficult for the market to be a restraint as prefectures with financially weak prefectures do not issue prefectural bonds. This suggests that if authorization to issue bonds was granted, it would lead to fiscal management with a greater issuance level of prefectural bonds.